Dentures are removable false teeth made of acrylic (plastic) or metal. They fit over the gums to replace missing teeth and eliminate potential problems caused by gaps. Gaps left by missing teeth can cause problems with eating and speech, and teeth either side of the gap may grow into the space at an angle. If this condition continues for too long, all the teeth may need to be removed and replaced. A partial denture fills in the spaces created by lost or missing teeth and is attached to your natural teeth with metal clasps or devices called precision attachments. Partial dentures can be made to match your natural teeth. A full denture will be fitted if all your upper or lower teeth need to be removed or you are having an old complete denture replaced. The denture is usually fitted as soon as your teeth are removed, which means you won't ever be without teeth. The denture fits snugly over your gums and jawbone. A partial denture is designed to fill in the gaps left by one or more missing teeth. It is either a plastic or metal plate with a number of false teeth attached to it. It usually clips onto some of your natural teeth via metal clasps, which hold it securely in place in your mouth. It can easily be unclipped and removed. Valplast® Flexible Partial Dentures are the comfortable, beautiful and affordable choice. It was long thought that removable partial dentures had to be rigid to be effective. 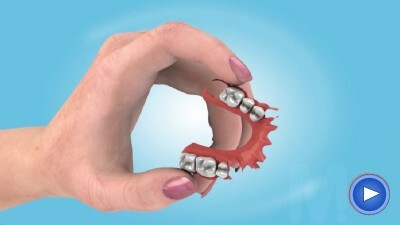 The innovation of the Valplast® Flexible Partial Dentures adapt to the constant movement and flexibility in your mouth. This is the underlying thinking behind Valplast's innovative flexible, removable partial denture. The flexibility, combined with strength and light weight, provides total comfort and great looks. Visit the Valplast website for more information. "Thank you for my super new look dentures - it's really helped in all ways they can. Much appreciated."